Fire Protection Pressure Relief Valve Model 750B-4KG1, UL Listed, FM Approved. This valve is a hydraulically operated pilot actuated automatic control valve designed specifically to automatically relieve excess pressure in fire protection pumping systems. Pilot controlled, it maintains constant system pressure at the pump discharge within very close limits as demands change. The main valve consists of a stainless steel body and only one moving part, an elastomeric liner or control element. 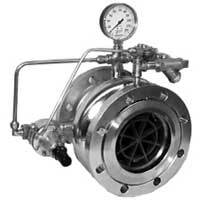 The valve will control from NO flow to full open flow without any chattering or slamming under low flow conditions. There is no slip-type friction because the valve has no bearings. The valve has an excellent resistance to cavitation with a Cf factor of 0.9. The valves can be supplied as a combination control valve with check. Pilot controls are fully piped at the factory and the valve is shipped complete, ready for installation. MATERIAL SPECIFICATIONS: Body: 316L stainless steel, Liner: Nitrile 70 durometer, Liner retainer: 316L stainless steel PILOT: Body: ASTM B62 Bronze, Spring cover: ASTM B62 Bronze, Wetted parts: Bronze/Stainless steel - Buna N.